This article might be more relevant for Angular 2 developers, but I believe it can be used with other frameworks as well. It’s just a handbook for writing scalable and maintainable single-page-applications. It’s important to note, that this is not the only way, but it’s a way that works for me in quite a few situations. One of the biggest challenges might be: extending existing logic and writing new features based on a tricky foundation. Single-page-applications are rather new, and especially older frameworks gave you 100 different ways to design an application. There wasn’t any structure, encapsulation and everything was tightly coupled to each other. Most of the time in the beginning of a project the development process went blazingly fast. But after a few developers, features, refactors, the code started to become less maintainable. It started to look like spaghetti. Frameworks have matured a lot, but it’s also important that the architecture of the software you write matures along with the process. To explain the architecture where this article is all about, here’s a reminder of how a web-application in 2016 might look like. These are concepts that your applications should rely on these days. It doesn’t matter whether using React, Angular 2 or something else. These principles exist to make sure that your web architecture becomes maintainable. Did you ever tried to make sibling components communicate with each other? Sometimes it seems pragmatic to do so, but please don’t. This is bad design! It’s almost impossible to see in which direction the data flows. I’s also very hard to maintain this code, fix bugs in it or develop features. What we do want, is a unidirectional dataflow like Flux or Redux. It basically looks like this: child components only notify their parent components, the parent (smart component) will send an action to a store that contains state, and that action will update the state for the entire application. When that state is being updated, we can re-evaluate the component tree. As a result the data always flows in the same direction (downwards). If you are new to unidirectional dataflows checkout the introduction to redux and the part about unidirectional dataflow. I designed a certain architecture based on principles of today (most of them explained above) and even principles from 10 years back. Would I say it’s the way to go for every SPA? Not at all… Every type of software deserves its own architecture, and I’m just showing a concept that works for me in a lot of scenarios. This architecture might come in handy for developers that are writing Angular 2 where we can profit from awesome features like dependency injection, but it can also be applied in other frameworks. This principle is partially based on the Sandbox principle of Nicholas Zakas, which is already a few years old. 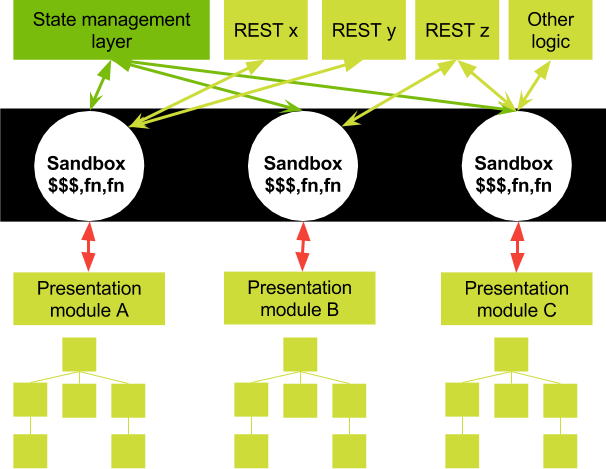 For Nicholas Zakas, the sandbox acts like a dispatcher between different modules where a module is like a smart component. In that architecture, there was no unidirectional dataflow though. 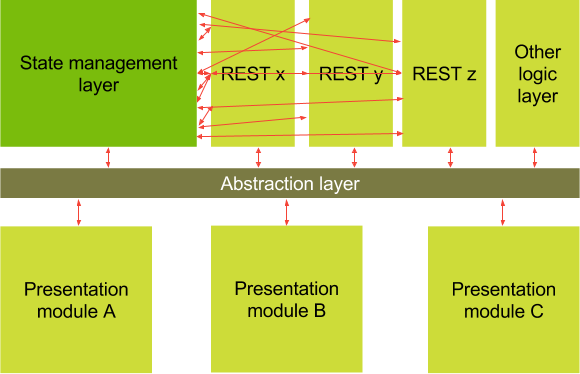 For me a sandbox is a way to decouple the presentation layer from the application logic, but that’s not its only responsibility. But let’s start from the beginning… In this particular scenario I’m going to assume that we use Redux. 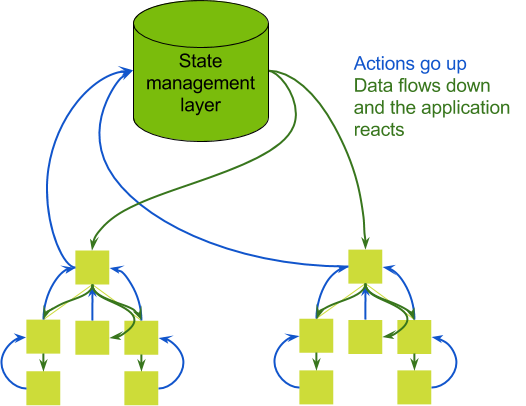 However, it doesn’t really matter what kind of state management you use, but it’s important that you know the principle behind it. The same reason you don’t let children play with everything: “It might get messy”. Smart components (also named containers here) should also follow a very strict set of rules. We don’t want to inject every service that we want in there, just because we can. For instance: it might not make sense to inject a game-engine in an authentication module. The following example shows a big constructor with a lot of dependencies. In this scenario MyComponent can pretty much do whatever it wants in the application. It gets injected whatever it wants and uses whatever it wants. That’s generally not a good idea. This is starting to look like spaghetti code, where everything is really tightly coupled. An abstraction layer could really help us here. 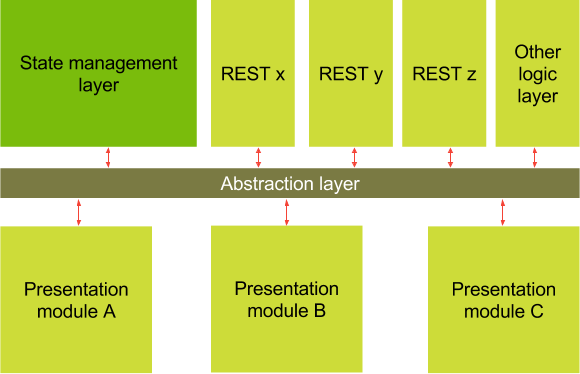 In the example below we can see that the presentation layer is completely decoupled and the abstraction layer delegates everything. Dumb components and smart components shouldn’t know that you use Redux, or any other state management layer for that matter. They should not care how state is being managed. They just trust that it’s being handled the right way. It’s not their responsibility. The responsibility of the presentation layer is “to present” and “to delegate”. // is this really my responsibility? But now our http services are very tightly coupled to our state management system. This is actually the only responsibility an http service should have. No it’s not just a facade :) It should have a certain amount of logic. This architecture is one way of doing things, but that doesn’t mean that it’s the only way. I do believe it’s very important to have encapsulation, loose-coupling and a decent structure of responsibilities. The frontend landscape evolves quickly, which means that we might want to be flexible for refactors/new technologies. I hope you enjoyed the article. Checkout strongbrew.io where Kwinten Pisman and me are giving a “reactive applications workshop” where we go more into detail on this subject. I want to thank the people who have reviewed this article and gave me their valuable input. Thank you so much Jurgen Van de Moere, Carmen Popoviciu, Manfred Steyer and Juri Strumpflohner!! !